In an effort to make attendance more convenient for members the OPCEA Board of Directors has decided to hold the annual general meeting at the 2019 WEAO Conference on Sunday April 14th, 2019 from 5-6pm at the Toronto Metro Center in Room #103 A. This is just prior to the Sunday Icebreaker Reception, which many members traditionally attend. The Board strongly urges you to make every effort to attend this event. This meeting provides a forum for the Board to update members on their activities and for members to make suggestions to the new board. This year, the OPCEA board requires two director positions to be filled. Nominations for the 2019 OPCEA executive will be taken from the floor. Should you wish to nominate someone prior to the AGM, please email names to Robert Lee Robert.lee@cematrix.com, Steve Davey steve@esemag.com, or Max Rao max.rao@aquafy-wt.com. See that all money due to the Association is collected and deposited in a chartered bank to the credit of the Association. Make all disbursements and perform all other financial duties prescribed by the board. If necessary, the Secretary/Treasurer shall ensure the Association’s books are audited prior to the AGM by an auditor appointed by the Board. Distribute any financial notices required to be given to members and to directors. Responsible for housekeeping of all financial books, papers, records, correspondence, contracts and other documents belonging to the Association. Dropbox – this is the method the EA office sends the monthly QuickBooks backup for the Secretary/Treasurer to review and prepare reports for the board and for the accountant at end of the year. TeamViewer – this is the method which allows the Secretary/Treasurer to make adjustments to the OPCEA financials. Secretary/Treasurer will need to investigate accountants available and interested in working with OPCEA, and make a recommendation to the OPCEA board for approval. Secretary/Treasurer position is a 5-year term. If interested please contact Robert Lee Robert.lee@cematrix.com, Steve Davey steve@esemag.com, or Max Rao max.rao@aquafy-wt.com. Please note: the Exhibition is sold out! 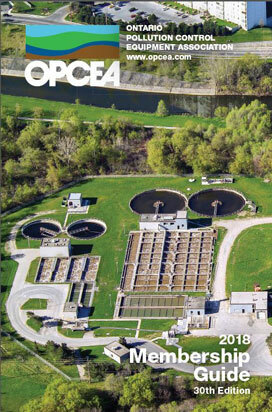 The 2019 OPCEA Exhibition, together with the WEAO Technical Symposium and Operators Challenge, offers the best opportunity of the year for suppliers to connect with designers and municipal engineers, operators and managers to demonstrate the latest and most innovative water, wastewater and process technologies. Held from April 14-16 and hosted in Toronto at the premier and centralized Metro Toronto Convention Centre, this event is expected to pull a higher volume of participants than normal. For suppliers, who want their message to be heard and their product to be showcased, this is a must-attend event. A reminder that only active OPCEA members are eligible to purchase a booth. Registration will open at the start of November 2018. Booths will be allocated on a first-come-first-serve basis through our new electronic registration system. Since that time, the association has grown to over 170 members and the directory has followed suit. The current edition is 84 full colour pages in size, and is “book bound” for added prestige and durability. It provides the name, contact information, and equipment, products and services provided for each member company. This directory enables you to source vendors from among OPCEA members, by searching the manufacturer’s name or product trade names or trademark. Copies are distributed to thousands of key environmental professionals across Ontario and at the annual WEAO/OPCEA conference and tradeshow. It is a most useful guide available for sourcing pollution control equipment and services for both municipal and industrial applications. A great opportunity exists for A great opportunity exists for Young Professionals in our industry to get involved, learn and network. Our associate organization WEAO (Water Environment Association of Ontario) has an excellent program for helping new professionals get involved. This Committee represents WEAO members with 10 or fewer years, or under the age of 35, in the wastewater industry. Its primary goal is to recruit, develop programs for, and encourage the participation of Young Professionals in the activities of the Association. Visit the WEAO YP webpage for contact information. in our industry to get involved, learn and network. Our associate organization WEAO (Water Environment Association of Ontario) has an excellent program for helping new professionals get involved. Visit the WEAO YP webpage for contact information.